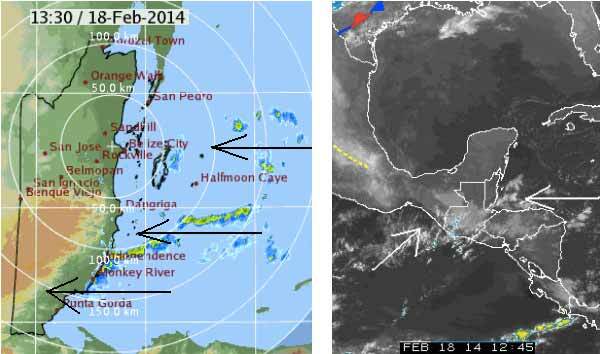 Belize NMS: Moderate increase in moisture will support a few showers. 24-hour forecast: Sunny with cloudy periods today and cloudy skies at times tonight. A few showers will occur in the south and some coastal areas this morning then inland this afternoon.Showers will re develop along coastal areas tonight. Today: Winds: E/NE 5-15 kts. ; seas: Choppy; waves: 2-4 ft.; a few showers(morning mainly). Tomorrow: Winds: East 5-15 kts. ; seas: Choppy. ; waves: 2-4 ft.; a few showers. Marine Outlook: Wednesday night:- winds: East 10-20 kts. ; seas: Choppy - moderate; waves: 3-5 ft.; a few showers(decreasing). On Ambergris Caye this morning the wind is ENE at 7mph with clear sky. Our expected high is 84. Looks like typical, Dry season at present. . . . .But there is significant Rain coming in from the Caribbean right now, and already over Monkey River. . . Central Belize will probably see that rain later today, probably next 2 - 3 hours, but it I dying out as it approaches Central Belize. . . . . . Presently Clear sunny sky over Belmopan, but white puffy clouds will develop later. . . .